I’ve been spending time this summer looking for interesting places to visit here in Virginia. The other morning I found a garden that is open to the public for a few weeks in the summer. It had lots of trails and because it was early there were dewdrops on the flowers. I saw day lilies that were different colors and many other flowers too. The trails were strewn with pine needles and pine cones and that fresh scent combined with the flowers was very fragrant. Along the trails were other plants, trees and flats of flowers yet to be planted. This was a perfect way to start the day. 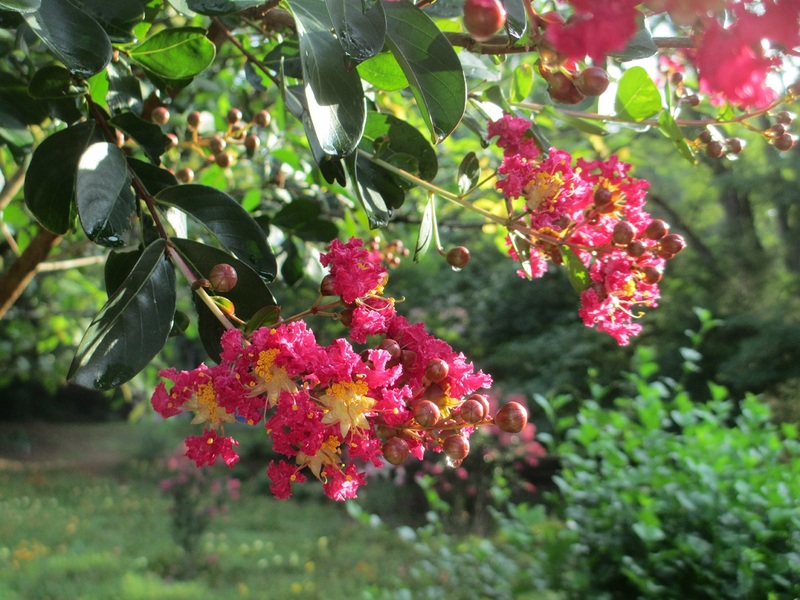 This entry was posted in Travel, USA and tagged flowers, Virginia, walking. Bookmark the permalink. Great start to your day. Thanks for sharing. You’re welcome – it was a wonderful morning! It was a marvelous morning for a walk! How beautiful and vibrant Meg! The colors were both bright and pale – I really liked that contrast! I could see it !! The juxtaposition of colors is one of my favorite things about gardens! It sure is a perfect way to start your day. Is it cooler in the morning? The “more greenery” is a photo of a variety of bottle gourd. Among Asians the young and tender fruit is a vegetable. I have planted several in our garden. It tastes as sweet as a zuke. Thank you so much for explaining that – I knew it was a gourd but I really appreciate your information! 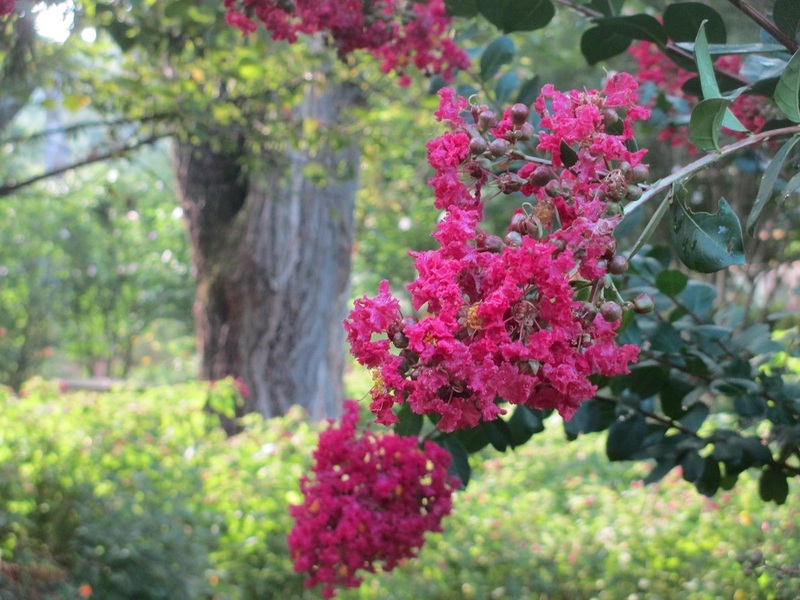 Lots of pretty things in bloom–including crape myrtles. They seem to be everywhere, after hiding away amidst the other trees the rest of the year, inconspicuously. I think that they are beautiful trees and I like the bark just as much as the flowers! There’s nothing better than a walk among beauty to start your day off right. Wonderful photos! Thank you – it was a lovely morning that I won’t soon forget! It was wonderful – I’ll have to find more gardens to visit! Thank you Shirley – flowers are so photogenic! You should walk with me, Meg :) This is lovely! Thanks Jo – I’ll join you for my next walk! Truly a perfect way to start your day. The flowers are lovely! It was a wonderful walk that I’ll remember for a long time! The fragrance of flowers (along with the pine scent) was marvelous! What a delightful place in which to start the day. Thank you – it’s fun to see things in your own area and really appreciate them!